Pretty 14k Gold Diamond heart cross pendant. This lovely cross design measures 19mm by 13mm across. Diamonds set in the heart that draped this cross are accents and total .04ctw. 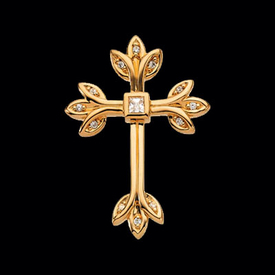 Cross available in 14k White or Yellow gold. Lovely Diamond cross pendant. Cross measures 24.5mm ( 1 inch) in length by 15.5mm across. Brilliant diamonds total 3/4 ctw and are SI clarity, G-I color. Order this beautiful diamond cross in 14k yellow or white gold. Check out our video to really see this diamond crosses true beauty. Large 14k White gold Diamond cross pendant. This bold cross is stunning, measures 58mm in length by 33mm across. Diamonds total .88ctw in this fantastic design. Diamond cross weighs 10.25grams. There are also diamonds on the bail in this design. 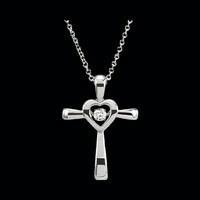 Beautiful 14k white gold rhythm diamond heart cross necklace. This incredible white gold cross features the moving diamond center and hangs from an 18" 14k gold cable chain. Gold cross measures 21mm in length by 15mm across. Motion diamond in the center measures .08ctw an is an exciting addition to an already lovely cross necklace. 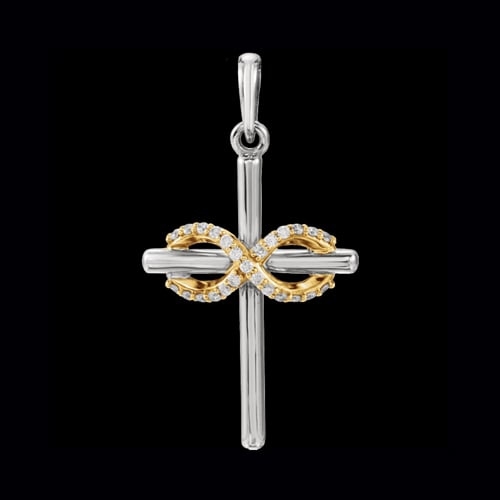 Striking 14k two tone yellow and white gold diamond cross pendant. This unique cross measures 22 1/2mm in length by 14.5mm across. Diamonds total .06ctw and enhance the infinity drape across this cross. Also available in 14k White with Rose gold accent. A very pretty cross. 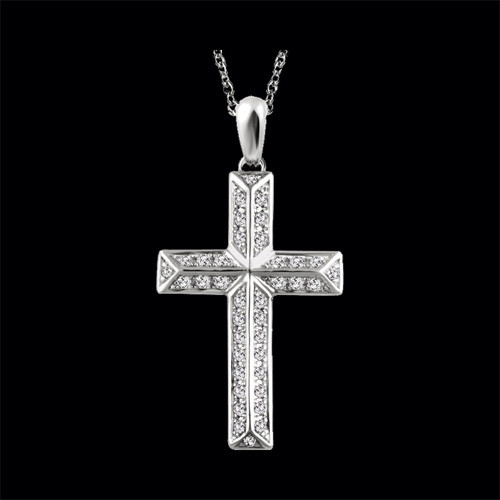 Classic design 14k white gold diamond cross pendant. This beautiful cross is available in 2 sizes starting with a 1/3 ct tw 28mm in length by 13.5mm wide selection. Also available in a larger 1/2ctw selection that measures 35mm in length by 20.5mm across. You'll love the classic style of this diamond cross. Chain is not included but easily added. 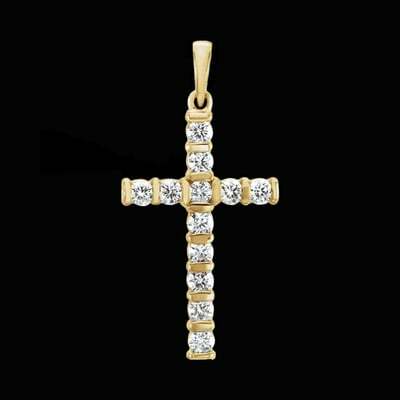 14k two tone gold diamond cross pendant. Diamonds total 1/6ctw in this lovely diamond cross. This cross measures about 24mm top to bottom by 15mm across. A beautiful diamond cross pendant. 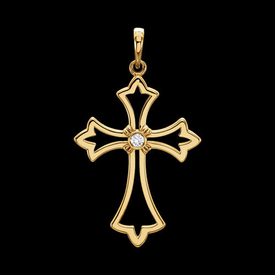 Incredible 14k Gold 1.25ctw diamond cross pendant. Cross measures 24mm in length by 15mm across. Diamonds are SI clarity G-I color. The diamonds are large for a cross pendant at 3mm round each, definitely a brilliant diamond cross. Special order this design in 14k White gold or Platinum use our request for pricing. Gorgeous 14k Gold and Diamond Cross pendant. Cross holds a 1/5ct round center diamond. Measures 25mm in length by 17.5mm across. Very nice diamond cross. 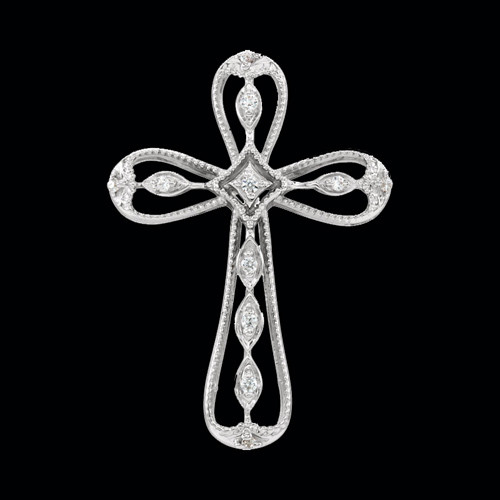 Pretty 14k Open design diamond cross pendant. Gold cross measures 32mm in length by 18.75mm across. A 2mm round .03ctw diamond sits at the center of this cross design. Available in 14k Yellow, Rose, or White gold. Also available in Platinum. Diamond cross pendant. 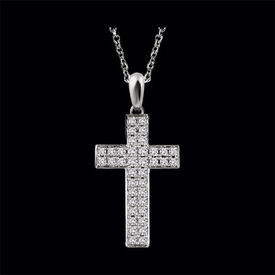 Beautiful Diamond bud design cross pendant. Cross features budded trefoil design with a diamond flower center. Cross measures 28.5mm in length by 20.5mm across. Diamonds are SI clarity G-I color and total .26ctw. 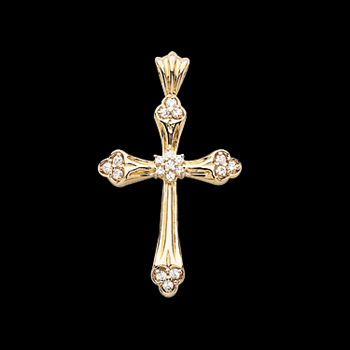 Buy this beautiful diamond cross in 14k Yellow gold or 14k White gold. 14k Gold cross pendant with a center diamond. Center diamond is .03ctw in the 15mm selection and .06ctw in the larger 21mm selection. This design is available in14k yellow or white gold and 2 sizes. 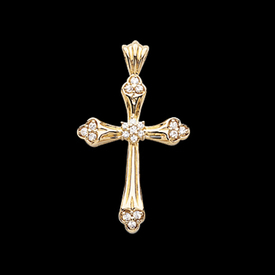 14k Gold Diamond Cross pendant. Beautiful pendant measures a large 31mm in length by 22.5mm across. Diamonds are SI quality G-I color and total 3/4 ctw. 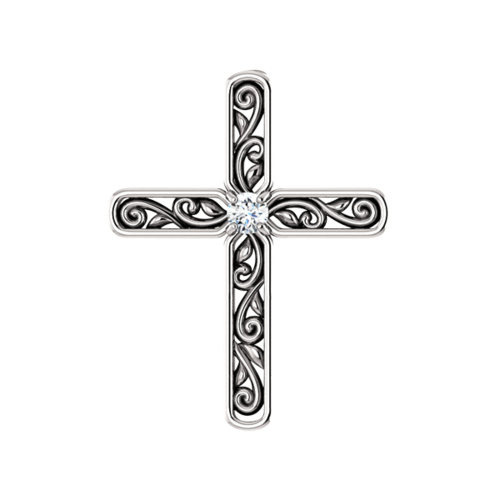 For just a few dollars more you can get this gorgeous diamond cross in Platinum. Gorgeous, vibrant, diamond cross pendant you'll Love. 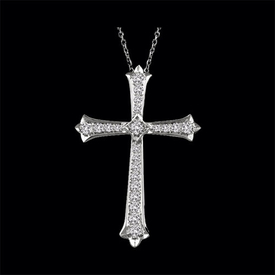 Pretty 14k White gold milgrain edge diamond accent cross pendant. This cross design measures 24mm top to bottom by 17mm across and accent diamonds total .05ctw. Order this cross alone or with a suggested chain. Stylish 14k Gold diamond and scroll design cross necklace. 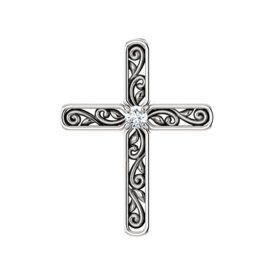 Lovely cross features a delicate scroll design accented with diamonds and finished with a beaded border. At the heart of this cross sits a petite diamond. Cross measures 22mm in length by 16mm across and hangs from an 18" 14k gold chain. A delightful cross for anytime. 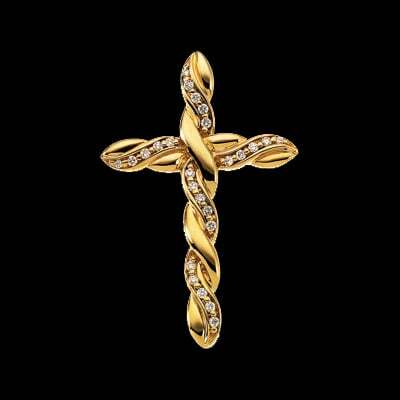 Beautiful 14k Yellow gold Diamond Tre design cross pendant. Diamonds total 1/4ctw in this exciting cross design features a 2.75mm Princess cut center diamond SI2-I1 clarity G-I color. Additional .12ctw accent diamonds are SI clarity G-I color. Gorgeous!!!! Stylish 14k gold budded design diamond cross pendant. This beautiful cross is available in a large variety of sizes starting with a 1/4ct tw 28.6mm in length by 20mm wide selection up to a full carat 44.3mm length by 31mm wide. Cross is available in 14k white gold, 14k yellow gold, and 14k rose gold. A very stylish diamond cross pendant. 14K Gold Large Diamond Cross with .23ctw Diamonds. Large cross measures 37.5mm in length by 24.5mm across. Brilliant diamonds are SI clarity G-I color. 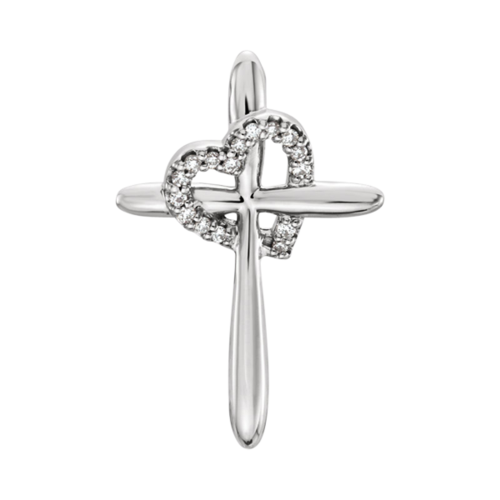 Beautiful diamond cross is available in 14k Yellow or White gold. Lovely 14k gold budded design diamond cross pendant. This beautiful cross is available in a large variety of sizes starting with a 1/4ct tw 28.4mm in length by 15.35mm wide selection up to a full carat 41.7mm length by 24.3mm wide. 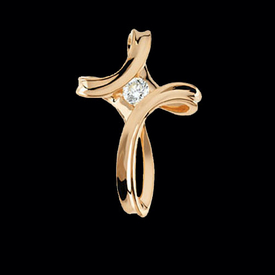 Cross is available in 14k white gold, 14k yellow gold, and 14k rose gold. A very stylish diamond cross pendant. Let jewelry express what words cannot. A diamond cross pendant worn around your neck is a subtle expression of your faith and a very personal type of jewelry that also makes a perfect gift for a loved one. Choose from a variety of elegantly handcrafted diamond cross pendants from Gracious Rose. We encounter symbols all the time. Whether it is a national flag, a monument, or a tattoo, these symbolic expressions create a powerful feeling that's hard to describe. Every person who chooses a cross pendant as an accessory surely has a deeply personal relationship and faith in Christ. There are many ways to express belief in Christianity, but wearing cross pendants have been a popular way of doing for a long time. It is common nowadays to see cross symbols not only in the church, but also in cars, hanging in rear view mirrors or on the dashboard, displayed inside homes, and as jewelry being worn by men and women all over the world. It is a beautiful expression of faith and a reminder that a higher being is watching over you. A cross pendant goes well with any outfit, be it casual or formal. Choose from a variety of diamond cross pendants from Gracious Rose and find the one with the best size, color, and style for your taste. All these, and many more designs are exquisitely handcrafted by jewelry designers from Gracious Rose, and we are proud to tell you that all our precious stones and metals are ethically-sourced from environmentally friendly suppliers. Whether you are buying one for yourself or as a gift for a loved one, our wide selection of elegant cross pendants will adds a little sparkle to any outfit in a subtle, yet noticeable manner. You can also choose from a wide array of chains to go with your selected pendant. This makes a nice gift for any occasion! Are you looking for something more fancy or striking? Search through our collection of large diamond cross pendants for the one that suits your style perfectly! For a piece that is truly special, fill out our online Customization Inquiry Form and our staff of jewelry consultants will have crafted a pendant that is uniquely you. Gracious Rose offers free shipping on orders over $250! Declare your belief in Christ with an elegant diamond cross pendant from Gracious Rose today!